This grand, pre-war apartment building is one of the few on the Upper East Side with very high ceilings. 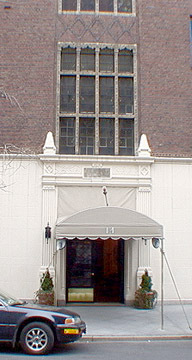 The handsome, brown-brick, castle-like building also has a great location across Madison Avenue from the great Whitney Museum of American Art and across the street from the handsome low-rise commercial building on the northwest corner at 964 Madison Avenue, which was designed in neo-Classical style by George F. Pelham in 1925. This 12-story building has 61 apartments, a doorman, a canopied entrance flanked by wall lanterns and sidewalk landscaping and a one-story limestone base with high-end retail space. It permits protruding air-conditioners but has no health club, no terraces, no balconies and no roof deck. 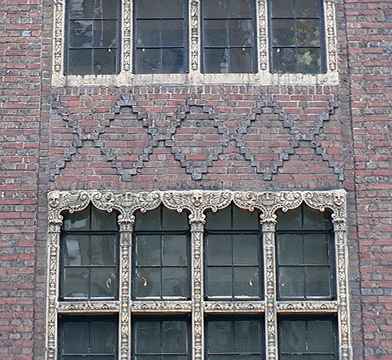 The multi-paned large windows are surrounded with attractive decorative detailing. There is good cross-town bus service on 79th Street and a subway station is nearby at 77th Street and Lexington Avenue. Central Park is one block away to the west and there are numerous religious and cultural institutions nearby as well as many art galleries and fashionable boutiques. The city's best cappucino can be had nearby on Madison Avenue at Fauchon (which used to be St. Amboeus). The western end of this street is anchored by The Commonwealth Fund in the former Edward and Mary Stillman Harkness House at 1 East 75th Street that was designed in 1907 by Hale * Rogers and is one of the city's most impressive neo-Renaissance mansions.